Makes it possible to connect a Astrosystems GBA ST2 bill validator to the CASH-Interface via 16pol. 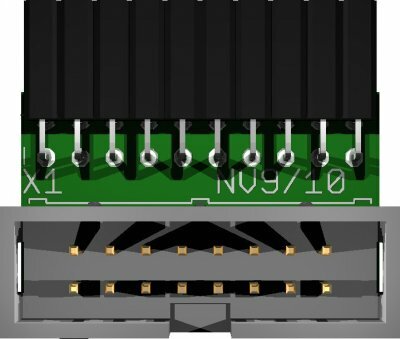 flat ribbon cable (NV10 plug), or to connect Astrosystems GBA ST2 bill validator to a NV10 bill validator interface. The Astrosystems GBA ST2 bill validator to NV10 bill validator adapter is made for use with PARALLEL, BINARY or PULSE protocol. The GBA-Adapter can also be used to convert machines equipped with an AstroSystems GBA bill validator and replace the GBA bill validator with an NV9 or NV10 bill validator. To achieve this use the AstroSystems "GBA Adapter Type 2", that offers a 20pin plug for the GBA cable and a 16 pol. plug for NV9 or NV10 cable.